This is quite different from the Christian West. In Roman Catholic theology, for example, there is an emphasis on children understanding what the Eucharist means before they are permitted to receive the Eucharist. Most Protestant Christians have inherited this viewpoint. However, historically, this restrictive view that infants and children should not be welcomed to the Lord’s Table only developed in the Western Church and dates only from about 800 years ago. All the Christian Churches of the East (including Coptic, Armenian, Syrian, Byzantine Orthodox, etc.) have maintained the earlier tradition of giving the Eucharist to infants as well as adults. In fact, infant Communion was also practiced as a norm in the West up until about 1200 A.D.
24. For several centuries the practice prevailed in the Church of giving children the Eucharist after the sacrament of baptism….For the last four centuries, the Western church has not given the Eucharist to children after baptism. But it must be admitted that the Rituals of the Oriental churches contain a rite of Communion for children after baptism. Assemanus the Younger (Codicis Liturgici), bk. 2, p. 149) gives the ceremony of conferring baptism among the Melchites. On page 309, he quotes the Syrians’ baptismal ceremony as it was published by Philoxenus, the Monophysite Bishop of Mabbug, and on p. 306, the ceremony from the ancient Ritual of Severus, Patriarch of Antioch and leader of the Monophysites. He gives also the ceremonies of baptism observed by the Armenians and Copts (bk. 3, p. 95 and 130). All of these ceremonies command that the Eucharist should be given to children after baptism. Here, Pope Benedict XIV dates the time the Latin Church stopped giving the Eucharist to children to 400 years earlier — in the 1300s. He recounts how the practice of the Eastern Church still gave testimony to Infant Communion and then notes the various Eastern Catholic synods which stopped the practice in imitation of the Latin Church from the 1500s to the 1700s. The specifics of the removal of Infant Communion can be read in the link to Pope Benedict XIV’s encyclical above. Eastern Orthodox Christians maintained the historic tradition, however. However, there is no uniform practice yet among Eastern Catholics on infant Communion. When my two children were Baptized and Chrismated (Confirmed) in the Ruthenian Byzantine Catholic Church in 1994 (ages 5 and 3), they were the first children in our Eparchy (Diocese) to receive the Eucharist at the time of their Baptism/Chrismation. The Ukrainian Catholic Church decided in 1997 to begin the restoration of infant Communion. Some parishes have implemented the change, but many have not. The tradition of “First Communion” dies hard in some places. The Melkite Greek Catholics (also in union with Rome) have generally restored infant Communion. According to this source, this has happened since about 1969, but many parishes have retained a “First Solemn Communion” that reflects the “First Communion” experience from the Latin Church. The vast majority of Protestant churches do not practice infant Communion, though a few Protestant churches do practice or tolerate it. It enjoys limited support by some Reformed writers and has been debated in the Episcopal Church. It has also become an issue for several Lutherans who are contemplating converting to Orthodoxy. Some Lutheran writers have also correctly noted that the discontinuance of the practice of communing infants in the Western Church dates from about the twelfth century. Since 1997, some parishes of the Evangelical Lutheran Church in America (ELCA) now practice infant Communion. The Greek word λόγος (pronounced and hereafter spelled logos) is primarily the equivalent of the English word “word.” Since its introduction into the lexicon of Western philosophy by Heraclitus in approximately 500 BCE, however, it has been procured by and passed through a variety of philosophical schools, including especially those of the Stoics and Philo, acquiring new meanings and nuances while losing others along the way. Finally, beginning with the writing of the Gospel of John near the close of the first century CE, the term was adopted by Christians, who both significantly altered the use of the word and simultaneously drew and elucidated upon previous definitions. Within the early Christian movement, logos would take on the most central and expansive role in the history of its use in philosophy. Man, according to Heraclitus, should strive to live in accordance with the logos. As the logos, the eternal and ultimate principle of Reason, is “manifest in the human being’s power of reason,”4 so “man should therefore strive to attain to the viewpoint of reason and to live by reason.”5 To live in accordance with the logos was to attempt to see the world the way the logos does, understanding that existence is necessarily in a constant state of flux and being content with this ever-changing reality and one’s place within it. Bearing thy image wheresoe’er we go. The use of the word logos to translate phrases like “the word of God” in the Septuagint, the Greek translation of the Jewish scriptures which was considered divinely inspired and used by the majority of Jews in the first century CE, also played a significant role in the growing Jewish-Hellenic synthesis of which Philo’s philosophy was a major part.15 For instance, Psalm 147:4 in the Septuagint version says that “He [God] sends his oracle to the earth: his word [logos] will run swiftly.”16 Several of the Old Testament prophets wrote about the “word [logos] of God” speaking to them. Ezekiel 29:1 in the Septuagint claims, for instance, that “the word [logos] of the Lord came to me.”17 Passages like these would play an increasingly important role as the Jewish-Hellenic philosophical movement culminated in the advent and development of Christianity. Similarly, no one, Greek or Jew, familiar with Greek philosophy would miss the importance of the Word, the logos, in John’s writing. John is clearly identifying the logos concept of Heraclitus and the Stoics with the God of the Old Testament, a step that even Philo, with all of his Hellenizing tendencies, was not willing to full take. From these ideas of the logos, some of them derived from the thought of other philosophical schools and others entirely uniquely Christian, Christians continued to explore their own theology and to ferret out its implications. Most important among these elements of Christian logos theology were the unique Christian ideas about the relationship of the logos to mankind. The word here translated “world” is, in the original Greek, κόσμος (kosmos), the same word used by previous Greek philosophers to refer to the harmonious order of all of material existence. For Christians, then, the logos was not just the generative principle behind existence who directs it into a harmonious order, the logos in fact became a part of the created order and gave himself for it to save it because of his love for it. With this statement, one sees the culmination of the philosophical tradition of the logos in its fullest development. The concept of the logos had certainly come a long way from its roots in the philosophy of Heraclitus in 500 BCE, where it was identified with the material element of fire and remained rather underdeveloped and vaguely defined. As it entered Stoicism, it took on new meanings, especially in its identification with God, and in the implication that mankind is a brotherhood of children of the logos, subject to its providential care. 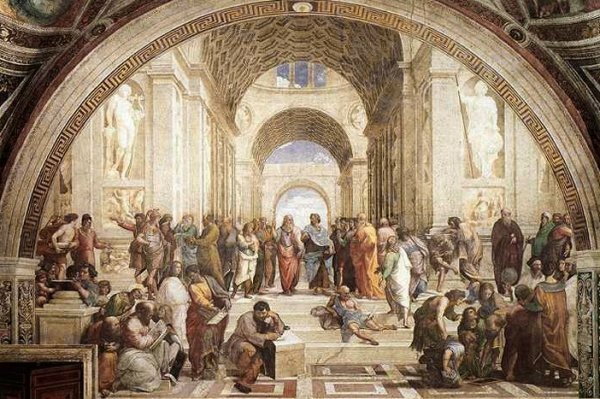 In the philosophy of Philo of Alexandria, the logos was stripped of the gross materialism that had previously weighed it down and brought into contact with the philosophy of Plato as well as with the theology and tradition of the Jewish Bible. Finally, the logos became man, or at least became identified with a certain man, in Christianity, and so became a historical figure as well as a personal and loving savior. Through all of these quite different philosophical contexts, however, the concept of the logos never lost its central meaning of which Heraclitus first spoke. It remained the Supreme Principle directing the order of the cosmos and the source of human reason to which human beings must conform themselves or perish. On the contrary, the movement of the concept of the logos through time and through various philosophical schools not only did no damage to the original concept, but in fact greatly enhanced, expanded, and deepened its original meaning. In the end, the logos was not simply a vague and abstract philosophical principle mindlessly balancing the cosmos, but a real and concrete person lovingly ordering his creation. 1 Richard Tarnas, The Passion of the Western Mind: Understanding the Ideas that Have Shaped Our World View (New York: Ballantine Books, 1991), 45. 2 Frederick Coplestone, A History of Philosophy, Vol. 1: Greece and Rome (Mahwah: Paulist Press, 1946), 43. 3 “Heraclitus of Ephesus” (2006) http://www.philosophy.gr/presocratics/heraclitus.htm (Accessed 18 Februrary 2011). 9 R.E. Witt, “The Plotinian Logos and Its Stoic Basis,” The Classical Quarterly 25, no. 2 (April 1931): 104. 10 Philo of Alexandria, “On the Creation,” 5.20, tr. Charles Duke Yonge (2010) http://www.earlyjewishwritings.com/text/philo/book1.html (Accessed 18 February 2011). 11 Calvin J. Roetzel, The World That Shaped the New Testament: Revised Edition (Louisville: Westminster John Knox Press, 2002), 146-7. 15 R.M. Price, “’Hellenization’ and the Logos Doctrine in Justin Martyr,” Vigiliae Christianae 42, no. 1 (March 1988): 20. 16 “Septuagint Old Testament Bilingual (Greek-English),” tr. L.C.L. Brenton (2010) http://www.ellopos.net/elpenor/greek-texts/septuagint/default.asp (Accessed 18 February 2011). 18 John 1:1-5, King James Version. 21 John Behr, Formation of Christian Theology, Volume 1: The Way to Nicaea (Crestwood: Saint Vladimir’s Seminary Press, 2001), 69. 23 1 Corinthians 1:23, KJV. 24 Jaroslav Pelikan, Jesus Through the Centuries: His Place in the History of Culture (New Haven: Yale University Press, 1985), 70. 26 Justin Martyr, “Second Apology,” VIII, in Ante-Nicene Fathers, Vol. 1: Apostolic Fathers, Justin Martyr, Irenaeus , eds. Alexander Roberts and James Donaldson (Peabody: Hendrickson Publishers, Inc., 1994), 191. 27 Gregory of Nyssa, “On the Making of Man,” V, in Nicene and Post-Nicene Fathers, Second Series, Vol. 5: Gregory of Nyssa: Dogmatic Treatises, Etc. , eds. Philip Schaff and Henry Wace (Peabody: Hendrickson Publishers, Inc.), 391. 28 Metropolitan Kallistos Ware, The Orthodox Way: Revised Edition (Crestwood: Saint Vladimir’s Seminary Press, 1995), 32-3. Behr, John. Formation of Christian Theology, Volume 1: The Way to Nicaea . Crestwood: Saint Vladimir’s Seminary Press, 2001. Chadwick, Henry. The Early Church . New York: Dorset Press, 1986. Coplestone, Frederick. A History of Philosophy, Vol. 1: Greece and Rome . Mahwah: Paulist Press, 1946. Gregory of Nyssa. “On the Making of Man.” In Nicene and Post-Nicene Fathers, Second Series, Vol. 5: Gregory of Nyssa: Dogmatic Treatises, Etc . Edited by Philip Schaff and Henry Wace. Peabody: Hendrickson Publishers, Inc.
“Heraclitus of Ephesus” (2006) http://www.philosophy.gr/presocratics/heraclitus.htm (Accessed 18 Februrary 2011). Justin Martyr. “Second Apology.” In Ante-Nicene Fathers, Vol. 1: Apostolic Fathers, Justin Martyr, Irenaeus . Edited by Alexander Roberts and James Donaldson. Peabody: Hendrickson Publishers, Inc., 1994. Miller, Ed. L. “The Johannine Origins of the Johannine Logos.” Journal of Biblical Literature 112, no. 3 (Autumn 1993): 445-57. Pelikan, Jaroslav. Jesus Through the Centuries: His Place in the History of Culture . New Haven: Yale University Press, 1985. Philo of Alexandria. “On the Creation.” Translated by Charles Duke Yonge (2010) http://www.earlyjewishwritings.com/text/philo/book1.html (Accessed 18 February 2011). Price, R.M. “’Hellenization’ and the Logos Doctrine in Justin Martyr.” Vigiliae Christianae 42, no. 1 (March 1988): 18-23. Roetzel, Calvin J. The World That Shaped the New Testament: Revised Edition . Louisville: Westminster John Knox Press, 2002. Russell, Bertrand. The History of Western Philosophy . New York: Simon & Schuster, 1972. “Septuagint Old Testament Bilingual (Greek-English).” Translated by L.C.L. Brenton (2010) http://www.ellopos.net/elpenor/greek-texts/septuagint/default.asp (Accessed 18 February 2011). Tarnas, Richard. The Passion of the Western Mind: Understanding the Ideas that Have Shaped Our World View . New York: Ballantine Books, 1991. Ware, Metropolitan Kallistos. The Orthodox Way: Revised Edition . Crestwood: Saint Vladimir’s Seminary Press, 1995. Witt, R.E. “The Plotinian Logos and Its Stoic Basis.” The Classical Quarterly 25, no. 2 (April 1931): 103-11. As I just finished up a class in ancient Greek philosophy, I can vouch for not only the hilarity of this video but its accuracy as well. Its maker has several other “Three Minute Philosophy” videos in addition to this one; they are all very worth checking out for both great information and laughs. During the years of the Renaissance, issues surrounding the relationship between the Church and the State as well as between the Church and the world at large came into high relief throughout Europe. The status quo of the Middle Ages was both widely questioned and vigorously upheld by opposing groups. At one end of the spectrum of opinion concerning these relationships were groups like the Spiritual Franciscans, who advocated ecclesiastical poverty and the renunciation by the Church of all secular power. At the opposite end of the spectrum of opinion were organizations like the Inquisition, which sought to expand the temporal power of the Church and to use that power against the Church’s enemies. One manifestation of this debate occurred in Russia, where the Orthodox Church was split between the Possessors, who advocated the ownership of land and serfs by the Church and a close relationship of the Church with the State, and the Non-Possessors, who advocated the spiritual poverty of the Church and a distancing of the Church from secular powers. The debate that began between the two at that council would last for another 20 years, splitting the monastics and others in the Church into two camps, that of the Possessors, originally led by Joseph of Volokolamsk, who advocated land ownership by the Church, and that of the Non-Possessors, originally led by Nil Sorsky, who opposed it. The issues at stake in the debate between the two parties naturally expanded during that period of time to include other topics connected to the two positions and disagreements necessitated by the original dispute; the overarching issues were what relationship the Church, and especially the monastic movement within the Church, should have with both the State and with the world outside of the monastery. The dispute finally reached a boiling point in 1526 due to the actions of the leaders of the Non-Possessors after the death of Nil Sorsky; these leaders were Vassian Cross-Eye, who had been a disciple of Nil Sorsky, and Maxim the Greek, one of whose teachers during his travels in Western Europe had been the Florentine reformer Girolamo Savonarola, the leader of a movement similar to the Non-Possessors.15 In that year, Vassian and Maxim made the mistake of openly criticizing Czar Basil III for his divorce, which had been unlawful according to the canons of the Orthodox Church. As a result, the Czar imprisoned both Vassian and Maxim and ordered the monasteries which had supported them to be closed. The Non-Possessor movement was nearly crushed and never recovered its former size and strength while the Possessors were granted official favor by the government.16 Both factions, however, would leave an enduring mark on the Russian Church as well as the nation as a whole; that legacy will be examined after a discussion of the central issues which divided the two groups, the respective stances of the groups on these issues, and the place of these issues in the Orthodox Church previous to the outbreak of controversy in the early 16th century. Before the official suppression of the Non-Possessors in 1526, three issues in particular had been at the heart of the debate between the two groups: property ownership by monasteries, the proper relationship between Church and State, and the correct treatment of heretics by the Church. At the root of the debate on the ownership of property by monks was a difference in perspective between those monastics who adopted the cenobitic, or communal, way of living in a monastery and those who adopted the eremetic, or hermit, way of life in a skete or hermitage. It is significant that the leader of the Possessors, Joseph of Volokolamsk, as well as his followers were cenobitic monks whereas Nil Sorksy and the rest of the Non-Possessors were eremetic monks.22 Their respective ideas reflect the tendencies inherent in each form of monasticism and are also reflective of differences that had existed between the two Orthodox monastic traditions from their beginnings in Egypt in the fourth century. According to those monks who followed this way of life, the primary tasks of the monk were those laid out by the Non-Possessors: praying for the world and setting an example. In the monasteries, among those monks who adopted the cenobitic way of life, first founded by the monk Pachomius (292-348), however, the attitude was somewhat different. It was recognized from an early date that a communal way of life would necessitate not only increased interaction between the monks but an increased interaction with the world outside the monastery. As a result, more emphasis was placed on charity, care for the sick, hospitality, and related works. The monks of Pachomius’s monastery, for instance, saved the leftovers from each of their meals for “the sick and aged, because the neighborhood is poor and populous.”24 That there were leftovers to be had from meals, indicating that the meals must have been of a sizable portions, and that there was apparently a neighborhood nearby the monastery are both substantial differences from the way of life recorded concerning the contemporary eremetic monks. This focus on charitable activities, it was recognized very early, required that monasteries have a certain measure of material resources. In the same ancient work already quoted on Pachomius’s monastery, for instance, it is recorded that the monastery included “fifteen tailors, seven smiths, four carpenters, twelve camel-drivers, and fifteen fullers” among its monks, indicating that the monastery must have also had the materials necessary for these jobs. The same work goes on to say that “they keep pigs too.”25 The controversy between the Possessors and the Non-Possessors on the issue of property ownership is reflective of this difference, and resultant tension, between the cenobitic and eremetic schools of monasticism, the foundations of which were laid in Christian monasticism’s earliest days. The second major issue dividing the Possessors and the Non-Possessors was the nature that the relationship between the Church and the State should assume. This issue was closely related to the issues of land ownership and monastic relations with the world and, like those issues, was an enduring source of tension in historical Christian thought that came to the forefront of controversy throughout Europe during the Renaissance. The third issue, that of the proper treatment of heretics, gave concrete implications to this difference between the two groups on the issue of Church-State relations. Joseph of Volokolamsk argued vehemently in favor of the use of power by the State against heretics, demanding that the czar have them burned at the stake after they had been convicted by a Church tribunal, in much the same fashion as the Inquisition of the Roman Catholic Church functioned in Western Europe.28 “Supported by Grand Princess Sophia, he secured the condemnation and burning” of the leaders of a popular heretical group in 1504.29 Nil Sorsky, on the other hand, “condemned all forms of violence and coercion against heretics.”30 He argued instead that the Church should work to win them over through persuasion and compassion. Later thinkers in the Russian Church were able to see both positive and negative aspects in the writings and ideas of both the Possessors and the Non-Possessors. The Possessors’ focus on charitable activities by the monasteries, for instance, is certainly a laudable thought. However, with too much focus on this element of the monastic vocation the Possessors came close to under-emphasizing the importance of silence, prayer, and the spiritual life for monks. On the opposite side, the Non-Possessors’ focus on the spiritual life and the practice of high ideals for monks was certainly a boon to the Russian spiritual tradition, and Nil Sorsky’s works were a major contribution to Orthodox spirituality, but simultaneously came dangerously near an individualist and quietist spirituality which ignored the need for practical work and care for others. There can be little doubt that it has been a very positive influence in the history of the Russian Orthodox Church that its leaders in the centuries following the controversy between the Possessors and Non-Possessors were able to recognize both the good and the bad of each side’s teachings and to attempt to find a middle road between the two extremes. The Possessors and the Non-Possessors, like their kin in the Western European movements respectively resembling each position, each helped to shape the form that both Church and the State as well as the relationship between the two entities would take during and after the Renaissance. 1 David Bentley Hart, Story of Christianity: An Illustrated History of 2000 Years of the Christian Faith (London: Quercus, 2007), 131. 3 “Russia to celebrate Christianization as official holiday,” Russia Today (28 July 2010) http://rt.com/news/russiachristianization-memorable-date/ (Accessed 9 February 2011). 4 Serge Zenkovsky, “The Russian Church Schism,” in Readings in Russian Civilization, Volume I: Russia Before Peter the Great, 900-1700, 2nd ed. , ed. Thomas Riha (Chicago: University of Chicago Press, 1969), 144. 5 John Julius Norwich, A Short History of Byzantium (New York: Vintage Books, 1999), 229-30. 7 James Patrick, Renaissance and Reformation (Tarrytown: Marshall Cavendish Corporation, 2007), 427-30. 8 Zenkovsky, “Russian Church Schism,” 144. 9 Timothy Ware, The Orthodox Church: New Edition (New York: Penguin Books, 1997), 84. 12 Bernard Pares, A History of Russia (New York: Dorset Press, 1953), 98. 18 “Nil Sorsky’s Rule for Hermits,” The Hermitage (2007) http://www.hermitary.com/articles/nil_sorsky.html (Accessed 10 February 2011). 22 David Goldfrank, “Old and New Perspectives on Iosif Volotsky’s Monastic Rules,” Slavic Review 34, no. 2 (June 1975): 279-301. 23 Benedicta Ward, tr., The Desert Fathers: Sayings of the Early Christian Monks (New York: Penguin Books, 2003), 8. 24 Paul Halsall, tr., “Chapter XXXII: Pachomius and the Tabennesiots,” in Medieval Sourcebook: Palladius: The Lausiac History (September 1998) http://www.fordham.edu/halsall/basis/palladius-lausiac.html (Accessed 12 February 2011). 26 Steven Merritt Miner, Stalin’s Holy War: Religion, Nationalism, and Alliance Politics, 1941-1945 (Chapel Hill: University of North Carolina Press, 2003), 16. 28 David Goldfrank, “Burn, Baby, Burn: Popular Culture and Heresy in Late Medieval Russia,” The Journal of Popular Culture 31, no. 4 (1998): 17–32. 31 Metropolitan Ephraim of Boston, “Do We All Worship the Same God?,” Orthodox Christian Witness (April 2007) http://nektarios.home.comcast.net/~nektarios/1571.html (Accessed 12 February 2011). 35 Edward Peters, Inquisition (Berkeley: University of California Press, 1989), 40-74. 36 Leo Pfeffer, Church, State, and Freedom (Boston: Beacon Press, 1967), 509. 37 David Burr, The Spiritual Franciscans: From Protest to Persecution in the Century After Saint Francis (University Park: Pennsylvania State University Press, 2001), 1-10. Burr, David. The Spiritual Franciscans: From Protest to Persecution in the Century After Saint Francis . University Park: Pennsylvania State University Press, 2001. Erlinger, Rachel. The Unarmed Prophet: Savonarola in Florence . New York: McGraw-Hill Book Company, 1988. Goldfrank, David. “Burn, Baby, Burn: Popular Culture and Heresy in Late Medieval Russia,” The Journal of Popular Culture 31, no. 4 (1998): 17–32. Review 34, no. 2 (June 1975): 279-301. Halsall, Paul, tr. “Chapter XXXII: Pachomius and the Tabennesiots.” Medieval Sourcebook: Palladius: The Lausiac History. September 1998. http://www.fordham.edu/halsall/basis/palladius-lausiac.html (Accessed 12 February 2011). Hart, David Bentley. The Story of Christianity: An Illustrated History of 2000 Years of the Christian Faith . London: Quercus, 2007. Kharkhordin, Oleg. The Collective and the Individual in Russia: A Study of Practices . Berkeley: University of California Press, 1999. Medlin, William K. and Christos G. Patrinelis. Renaissance Influences and Religious Reforms in Russia . Geneva: Librairie Droz, 1971. Miner, Steven Merritt. Stalin’s Holy War: Religion, Nationalism, and Alliance Politics, 1941-1945 . Chapel Hill: University of North Carolina Press, 2003. “Nil Sorsky’s Rule for Hermits.” The Hermitage. 2007. http://www.hermitary.com/articles/nil_sorsky.html (Accessed 10 February 2011). Norwich, John Julius. A Short History of Byzantium . New York: Vintage Books, 1999. Pares, Bernard. A History of Russia . New York: Dorset Press, 1953. Peters, Edward. Inquisition . Berkeley: University of California Press, 1989. Pfeffer, Leo. Church, State, and Freedom . Boston: Beacon Press, 1967. Pospielovsky, Dimitry. The Orthodox Church in the History of Russia . Crestwood: St. Vladimir’s Seminary Press, 1998. “Russia to celebrate Christianization as official holiday.” Russia Today. 28 July 2010.
http://rt.com/news/russia-christianization-memorable-date/ (Accessed 9 February 2011). Sorsky, Nil. Nil Sorsky: The Complete Writings . Edited and Translated by George A. Maloney. Mahwah: Paulist Press, 2003. Ward, Benedicta, tr. The Desert Fathers: Sayings of the Early Christian Monks . New York: Penguin Books, 2003. Ware, Timothy. The Orthodox Church: New Edition . New York: Penguin Books, 1997. Zenkovsky, Serge. “The Russian Church Schism.” Readings in Russian Civilization, Volume I: Russia Before Peter the Great, 900-1700, 2nd ed . Edited by Thomas Riha. Chicago: University of Chicago Press, 1969. When evening arrives, I return home and go into my study, and at the threshold, I take off my everyday clothes, full of mud and filth, and put on regal and courtly garments; and decorously dressed answer, I enter the ancient courts of ancient men, where, lovingly received by them, I feed myself on the food that is mine alone and for which I was born, where I am not ashamed to speak with them and to ask them about the reasons for their actions, and they, in their humanity, respond to me. And for four hours at a time, I do not feel any boredom, I forget every difficulty, I do not fear poverty, I am not terrified at death; I transfer myself into them completely. This major restoration project began back in 1993, a few years after the Hagia Sophia was declared a UNESCO World Heritage Site together with the rest of the historic centre of Istanbul. It wasn’t until last year, when the city was designated European Cultural Capital 2010, that the works were hurried along and finally finished, after nearly 20 years. It was Ataturk, founder of the modern Republic of Turkey and the country’s first president, who decided that this beautiful monument should be neither mosque nor church, but a museum open to the general public. 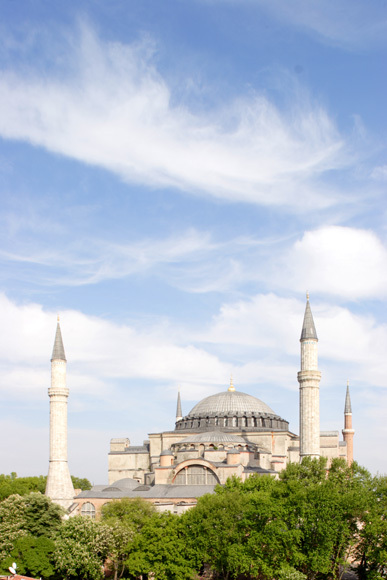 The main focus of the restoration work was to restore the splendour of the building’s immense sixth-century dome, an architectural wonder measuring 31.5 metres in diameter whose innovative design is largely responsible for the mystical quality of light for which the Hagia Sophia is famous. To clean and restore the golden mosaics that cover the dome, the craftsmen had to work on scaffolding at heights of up to 55 metres.